If turned 'On', the 'Set Optional Data' dashboard message for importing scholarly contributions has been modified. The message now reads 'Assign Activity Classifications for imported Scholarly Works'. Administrators can turn ORCID on/off for faculty users. This is a temporary measure to accommodate those clients that havent uploaded their institutional ORCID credentials to F180 yet. Within the Admin tab, and the Tools page, administrators will have access to delegating access to Support accounts. First, this is what the table looks like when there are no accounts added. Below is the table with support accounts added. Below is the error message that is generated if the table was not saved correctly. When working on the Activity Input Form, the Instructions that the faculty see will now be collapsible and anchored to the top of the page. 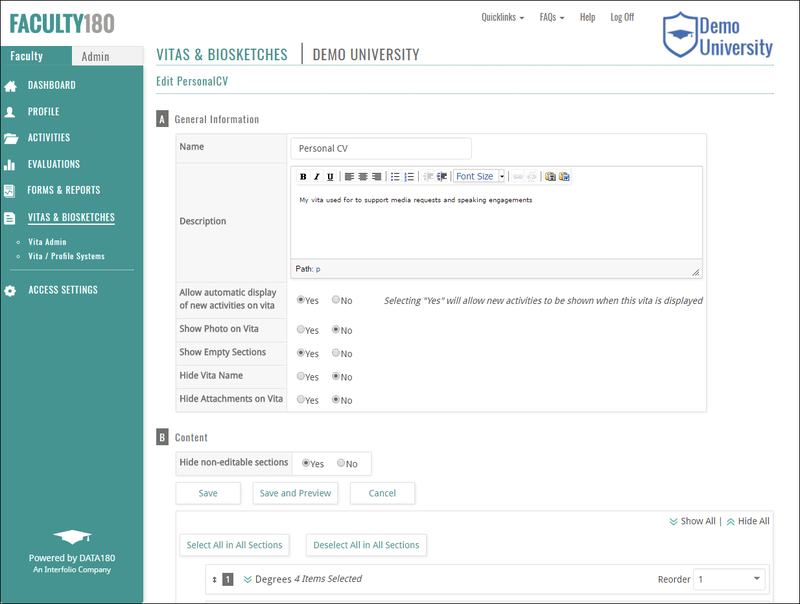 When working on their VITAs, faculty can toggle on hidden/uneditable sections that would otherwise not be visible.